The history of KVINT dates back to 1897, when the first rectification warehouse was built and launched into operation in Tiraspol. At that time it was specialized in production of 40% alc. vodka from homemade grape wines purchased from the peasants of nearby villages. The production of divins was started 4 decades later — first wine-distilled spirits were put for ageing in 1938. Nowadays this company with more than 118 years of history holds a leading position among the manufacturers of alcoholic beverages in Moldova. Unique climate, fertile soil, hilly terrain and vicinity of the river Dniester created most favorable conditions for growing best grapes; modern equipment, advanced technologies, original recipes, respect to ancient traditions and passionate work of KVINT professionals — all these factors allow us to produce admirable beverages, which compete with world renowned brands. The Winery has its own raw materials source — approximately 2000 hectares of vineyards, where we grow more than 20 varieties of grapes. In our cellars we keep 10 million liters of eaux-de-vie spirits aged from 1 year to 60 years. With this wide range of aged spirits a Master of the Cellar enjoys a greater freedom and flexibility for developing new brands. Annually we output about 20 million bottles of alcoholic beverages, including over 30 names of divins aged from 3 to 50 years, table and vintage wines, vodkas, gin, hard liquors, calvados. Starting from 2000 our production is certified against ISO:9001 (BVQI). Numerous awards won at various international contests and tasting competitions prove the premium quality of KVINT products: 3 Super Grand Prix Trophies, more than 20 Grand Prix, and about 230 gold and silver medals. The roots of vine-growing and wine-making on the banks of the river Dniester are incredibly deep, and the traditions are guarded and handed down from generation to generation. 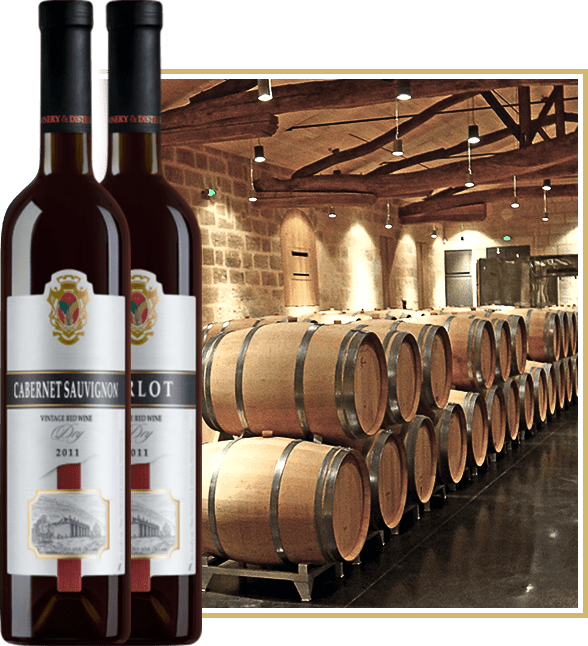 The mission of the Tiraspol Winery & Distillery «KVINT» is to keep the centuries-old experience of the masters, to increase knowledge and to develop new technologies. All these endeavors are aimed at one target — to let you enjoy exquisite, harmonious drinks; indulge in the beauty and hospitality of our blossoming land, its vineyards bathing in gentle sunlight; feel care and love of our masters deliberately and intently creating masterpieces.